Dubai – World’s biggest, tallest and fastest! 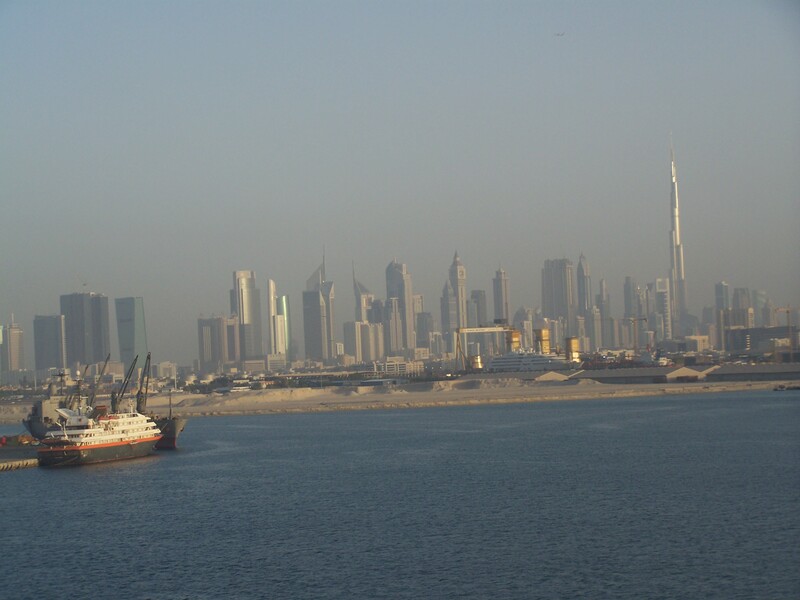 Dubai — viewed from The Mariner of the Seas. Look for the world’s tallest tower, Burj Kalifa. 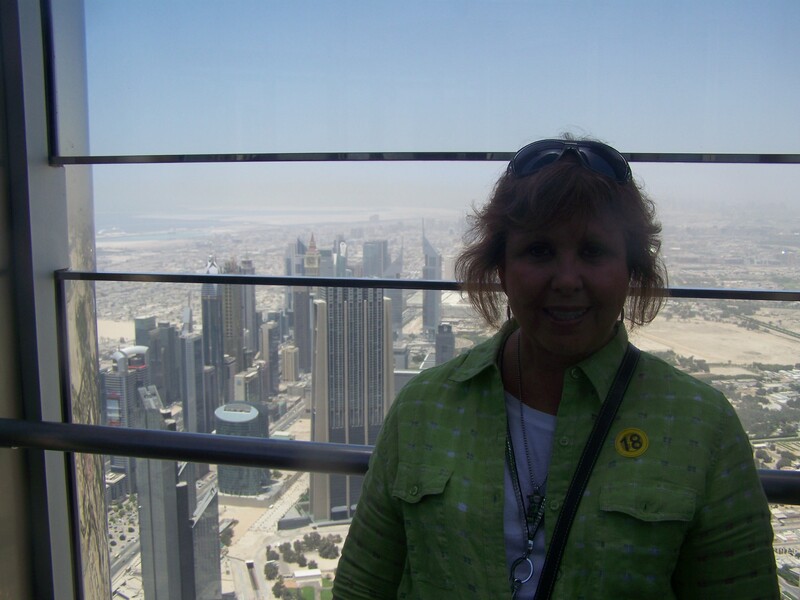 The view from The Top of the Khalifa Tower — world’s tallest building! If the city of Dubai set out to break all records for expectations of a modern city, it has surely succeeded! Here we found the world’s tallest building, Burj Kalifa. We entered the world’s fastest elevator to take us to the top – The Top! My ears popped three times going up and five times going back down! Yes, it truly is fast! The view from The Top was incredible, even with the haze that lingered over the vista; you could see the surrounding desert, water and spectacular cityscape. Looking straight down, the streets and cars resembled a diorama or mere toys. It was spectacular! We toured this city full of skyscrapers, which are perfect examples of modern-day architecture, on May 21! Also, the Dubai Mall, which – by the way – has one of the world’s largest aquariums and the largest viewing panel on earth! Are you getting the picture now – everything here is bigger, taller or faster! But, Dubai is full of contrast – the old and the new. Having only gained independence in 1971, it is part of the United Arab Emirates and is considered by many to be the financial and trade center of the Arab world. The old and new exist side by side in this extremely clean, modern city. Local people go about their day-to-day lives observing their centuries-old, Islamic traditions. While the city is also filled with westerners, tourists, and businessmen converging to give the appearance of any other European or American city, life outside the city, in stark contrast, consists of desert dwellers or Bedouins. We knew on April 21, as we left the shores of Galveston, that we setting sail on a journey of a lifetime aboard Royal Caribbean International’s Mariner of the Seas – 41 days. By the time we docked in Barcelona, we had cruised 5,456 nautical miles. That was the first two-week cruise, which included Nassau, The Bahamas; the Island of Madeira, Portugal; Gibraltar; Alicante and Barcelona, Spain. All glorious and wondrous sights! By the time we reached Dubai, the destination for the second, two-week cruise, we had covered another 5,050 nautical miles, making a total of 10, 506 miles for the first two legs of our journey. This time our ports of call included Alexandria, Egypt; The Suez Canal; Safaga, Egypt; Aqaba, Jordan, and ending in Dubai. When we left Aqaba on May 14, one of many stops on this transatlantic journey from Galveston to Singapore, the guests were made aware of the precautions the captain would take, as we sailed from the Red Sea into the Sea of Aden to get to Dubai. On this day, Captain Flemming sent letters to guests and made PA announcements explaining his plan. He wanted to prepare us in the event of a pirate attack. That day we even had a pirate drill, where we were instructed to go to the inside hallways if we heard the “secret code” on the PA. We were also told to keep the curtains closed from 6 p.m. until 6 a.m. during those days in the Aden Sea. For four nights the upper, outside decks were closed and all lights extinguished. Last night was the first night the outside decks were once again open after dark, and we could open the drapes, as well. While this little bit of information was not in the cruise guide, we were very appreciative of all the efforts our captain took to make sure the guests would be safe. Among those precautions was extra security. At one point in the middle of the sea an announcement was made to alert passengers that a small boat would be approaching our ship; however, this rendezvous was for the purpose of collecting our “security kit.” Indeed, it was a drop shipment of arms. We watched as the boat pulled along the ship to unload. On the last day, once again the boat came to collect the “security kit,” when it was no longer needed. Our thanks go to Captain Flemming for making a plan for our protection and for being cautious. After leaving the Persian Gulf, we are now cruising the Indian Ocean. Next stop – Goa, India! Bye for now…see you next time! Look for a link to Trilla’s Travels on http://www.ourtribune.com. 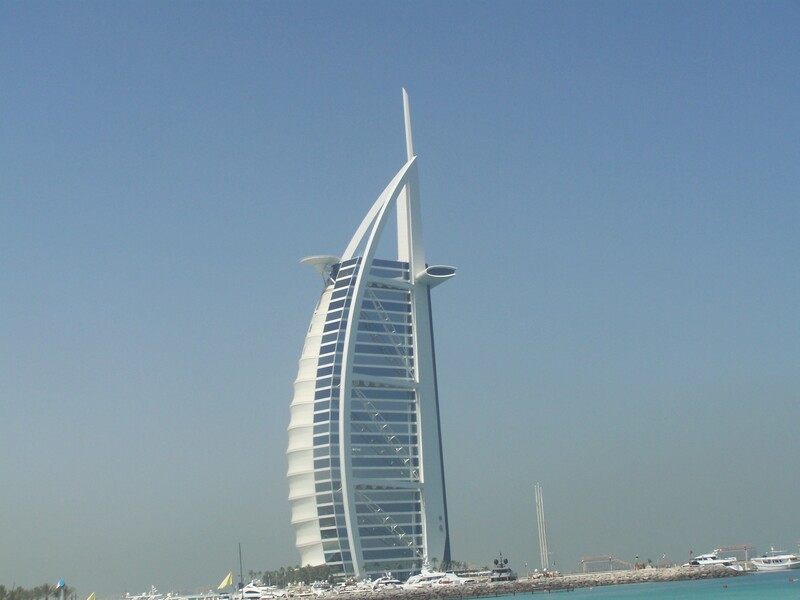 Burj Al Arab – This building is amazing! ← Aqaba and Petra, Jordan – Spectacular! This is wonderful Trilla. Thank youmso much.